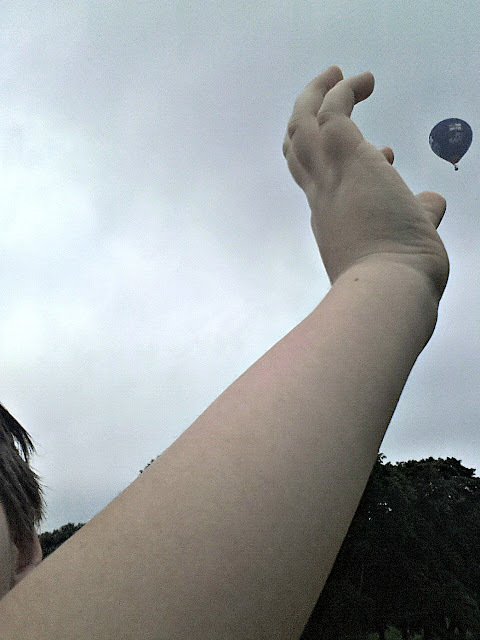 L was put in charge of the Sunday Photo this week, as he loves taking photos of air balloons. Being on the flight path for the Bristol Balloon Fiesta, (depending which way the wind is blowing!) we see a lot of air balloons. This one, however, was unusually low. So low, that I actually struggled to get a photo of it, as it was so huge in the frame! L took this shot himself, before we set off, in search of it in the nearby fields. It must have landed, but managed to travel further than we could on foot, before reaching the ground. I hope the passengers had a pleasant landing! I love a bit of forced perspective. well done! Very clever positioning. I bet seeing all the balloons must be incredible. We hardly seen balloons here in Ireland. We used to have great fun as kids chasing across the fields in Oxfordshire.